Has summer just begun … or is it just about over? I’ll try to make this short and sweet … summer ideas have been filling my head … today I’m sharing the first. I’ll keep sharing until my brain is empty or until everyone tells me to stop! Do you like to go on cruises? I have never been on a cruise for several reasons … one is that I’m truly afraid of falling overboard … that’s probably why I had to have a life-preserver on my marshmallow sailboat … another one is that “Jaws” has scarred me for life! I have been on boats, but never so far away from land that I can’t see it. I do want to go on an Alaskan cruise … maybe I can handle it without an anxiety attack! Cover your working surface with wax paper or parchment. Cut the straws in half. Use the edible marker to draw lines on the smooth side of LifeSavers (omit this step if you want plain life preservers). 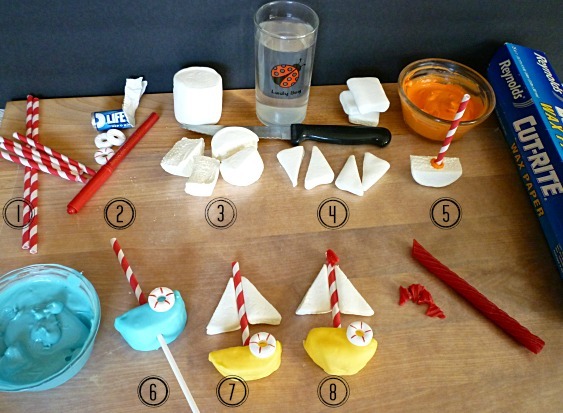 Use a serrated knife dipped in water to cut the JumboMallows into 4 half circles (boat hull). Cut each StackerMallows into 2 triangles, using the same method. Melt the CandiQuik. Reserve 4 ounces (1/4) melted candy white (to be used later) … color the remaining candy as desired (I did 4 ounces each, blue, yellow and orange). 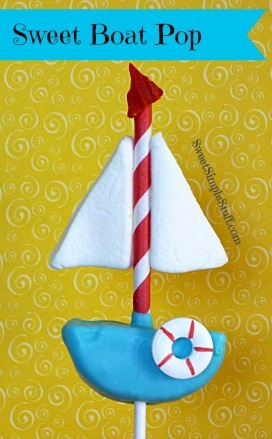 Dip tip of paper straw into colored candy and insert into top of boat hull, let dry. 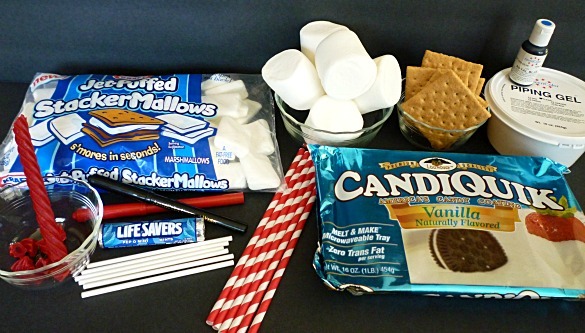 Dip boat hull into colored melted candy, cover marshmallow completely and tap off excess candy. (Insert lollipop stick if you are making pops) Place LifeSaver on boat and chill for a few minutes. 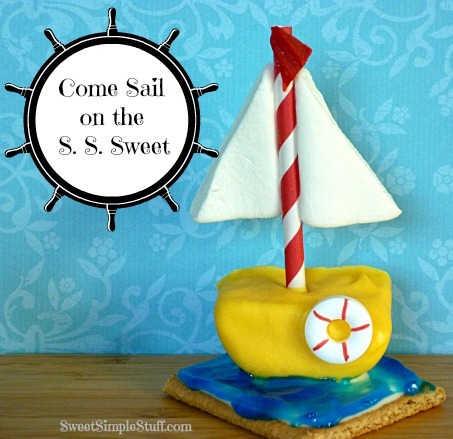 Attach StackerMallow sails by using a little water on the edge of the marshmallow (cut edge facing out) and attaching to paper straw (about 1/2″ from top) … allow to dry. Use a little water to attach licorice flag to the top of the straw … allow to dry. Color about 1/4 to 1/2 cup piping gel blue. Spread a light layer of white melted candy on a graham cracker square. Lay sailboat on melted white candy and allow to dry or chill for a few minutes. 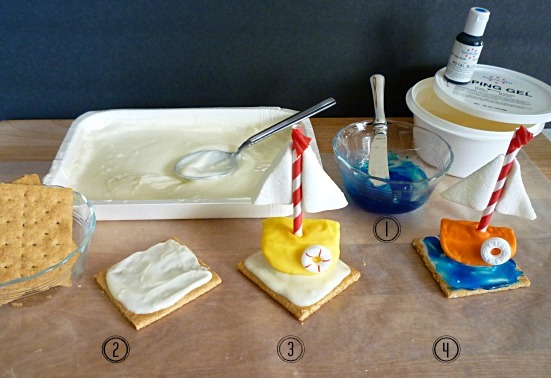 Use a small spreader or spatula to smear blue icing over the white candy. Note: the piping gel will stay gooey and really looks wet … like water should look! Looks like clear sailing to me. These are so cute. Cute!!! I had never been on a cruise either but bit the bullet and went to Alaska this year. LOVED it. You can do it. It is a piece of cake. Cruise the inside passage and most of the time you don’t even feel the ship moving. Thanks Carolyn 😉 That’s a cruise for me! Great idea for the end of the year sailing competitions here in HK. I will have to book mark this one for the end of the school year. Now them are just darn right adorable. These would be so cute for alittle guys birthday party; especially for someone who lives along a beach front or even someone who is having a pool party. When; (you noticed I said When and not If ); when you decide to go on your Alaska cruise; do enjoy it and take in all the gorgeous surroundings and take lots of pictures for your memory book. Will be an experience that you will never forget. From what I have heard, taking a cruise to Alaska is the best way to go. Thank you Colleen 🙂 Now that you mention little guys … how about a baby shower? Thank you for all of your great ideas … you inspire me! When I go to Alaska … I will take lots of pictures! These are too cute!! Yes, it’s crazy how fast stores start putting out fall stuff!! I’m just not ready … for the fall stuff! Love your sailboat pops! I sadly can’t cruise as I get vertigo if I sleep on a boat. How do I know that, I slept on a boat and felt like I was on a boat for 3 weeks after I departed. It wasn’t fun and it’s so sad because I am a water freak. I love to swim and would spend every weekend on a boat, if we owned one. I’ve taught thousands of people to swim and know just how afraid many people are of the water. 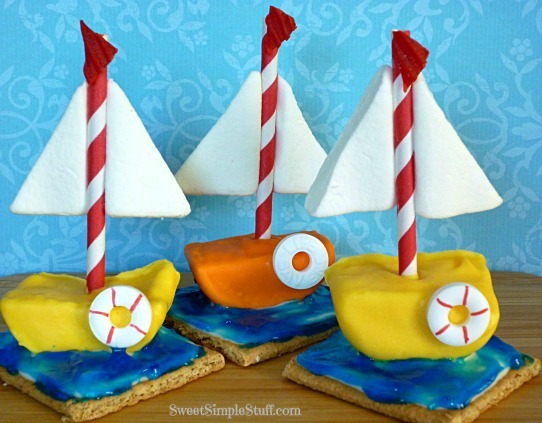 Even if you can’t enjoy an actual cruise, you can certainly enjoy your cute boat treats. Pinning! Thank you Beth 😉 I am probably more afraid of what’s in the water, than the water itself. Super cute! I would love for you to share and link up at my weekly TGIF Link Party if you haven’t already this week. Your favorite posts, most popular, recent or new! The party is open every Thursday night and closes Wednesday’s at midnight. Followed by (Not SO) Wordless Wednesday! http://apeekintomyparadise.blogspot.com/.